ST. PETERSBURG, Fla. — Baseball’s trade deadline comes at the end of the month. The Red Sox made it clear to general manager Theo Epstein last night, in both action and deed, just how desperately they need help in the bullpen. Manager Terry Francona left the unreliable Daisuke Matsuzaka in the game long enough to give up a four-run lead before finally turning to his relievers. That didn’t work either as the Tampa Bay Rays came away with a 6-5 victory. A six-game road trip before the All-Star break opened with a loss that sent the Red Sox tumbling back into third place in the American League East. The dispiriting setback left the visitors’ clubhouse nearly empty within 15 minutes of the final pitch as players dressed quickly and fled into the humid night. One of the few who stuck around was closer Jonathan Papelbon, who sat alone on a chair nursing a beer, his services not needed despite the Red Sox building a 5-1 lead. As Matsuzaka and Ramon Ramirez gave the game away, the Red Sox produced two hits over the final five innings against six Tampa Bay relievers. Randy Choate (2-2) was the winner with Rafael Soriano earning his 22d save. 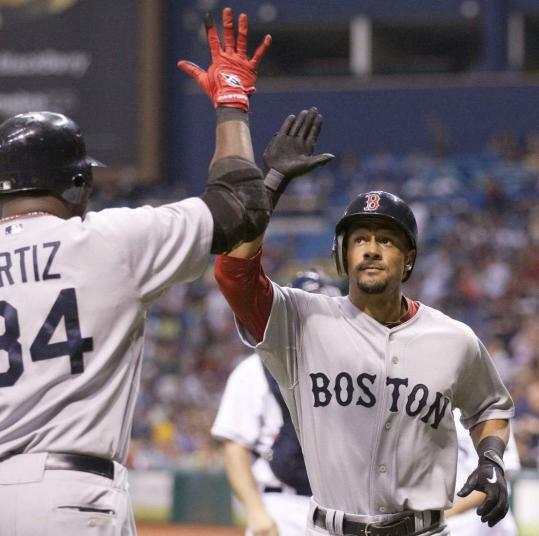 “That was a tough one for everybody,’’ David Ortiz said. After the Rays scored two runs off Matsuzaka in the sixth inning to tie the score, Ramirez (1-1) gave up singles to Matt Joyce and Sean Rodriguez to start the seventh. With Carlos Pena up, the Red Sox shifted their defense to the right side. Pena’s grounder up the middle might have been a double play ball otherwise. But when Marco Scutaro fielded it, his only play was to first. “I didn’t want the ball to get through,’’ Scutaro said. That moved the runners over and Jason Bartlett’s fly ball scored pinch runner B.J. Upton. Red Sox relievers have allowed 29 earned runs over their last 30 1/3 innings. The meltdown overshadowed the work of Eric Patterson, who had two home runs and a double in his fourth game with Boston. It was his persistence that helped the Red Sox score four runs in the third inning. With two outs, Patterson fell behind in the count, 1 and 2, against Rays starter Matt Garza. Patterson fouled off a curveball, a slider, and two 94-mile-per-hour fastballs before getting a full-count slider down the middle that he launched into the seats in right field. It was Patterson’s first home run since May 15, while a member of the Athletics. The blast led to big things. Garza walked Ortiz before Kevin Youkilis drove a ball into the right-field corner that struck halfway up the section of the wall next to the foul pole. Ortiz slowed to a jog as he approached third, only to be frantically waved to the plate by third base coach Tim Bogar. He scored as Youkilis picked up his fifth triple, the most he has had in a season. Adrian Beltre followed with an RBI single. Singles by J.D. Drew and Bill Hall drove in Beltre and gave the Sox a 4-1 lead as Garza threw 49 pitches in the inning, ending his night. Andy Sonnanstine replaced Garza for the fourth and allowed Patterson’s second home run. But the four-run lead was not enough for Matsuzaka. With the Rays down, 5-1, in the fifth, Ben Zobrist singled. Carl Crawford’s third hit of the night put runners on the corners. Evan Longoria’s fly ball to deep center scored Zobrist. Willy Aybar, who had struck out twice, dropped a double down the left-field line that pushed Crawford to third. A passed ball allowed Crawford to score as Matsuzaka threw a cut fastball with catcher Kevin Cash expecting a slider. “Just some miscommunication there,’’ Cash said. The sixth featured another mental error by Matsuzaka. Rodriguez led off with a double before Pena walked. Bartlett bunted to Matsuzaka’s right. Cash and third baseman Adrian Beltre yelled at Matsuzaka to throw to first. But the pitcher fielded the ball, looked at third, and then froze. That allowed Bartlett to reach, loading the bases. Yet through interpreter Masa Hoshino, Matsuzaka said it was his intention “right off the bat’’ to make a play a third and that he could not hear Cash and Beltre. With the bases loaded, no outs, and Matsuzaka crumbling, Francona left Dustin Richardson and Ramirez in the bullpen. The manager did not have Hideki Okajima (stiff back) available and did not want Richardson, a rookie, facing Tampa Bay’s righthanded-swinging pinch hitters. “With one lefty, we had to kind of pick our spots,’’ Francona said. Matsuzaka got ahead of John Jaso, 0 and 2, before running the count full and leaving a slider up and out over the plate. Jaso drove it into center to drive in two runs. When Francona finally went to the bullpen, Richardson got two outs and Ramirez one to end the inning. The Sox had a chance to retake the lead in the seventh, loading the bases with one out. But Beltre struck out swinging, as did Drew.